Whether based on goalie performance in the Bronze game, or success from last week or just a random flip of the coin, Ashmore decided again that Team Juniors wanted to start with Justin in net, so the long awaited 2014 Gold Medal game was ready for the opening faceoff. Goalie choice appeared to be prescient as Team Juniors scored 4 goals quickly and seemed in complete control. Team Russ finally got to Justin and then a stray shot caught him on the chin opening up what appeared to be a fairly significant cut. After a few attempts to staunch the bleeding, Justin soldiered on keeping Team Russ at bay and only letting in 1 more goal to the half. Team Juniors kept upping the score and, in another strange strategic move, shook up Guntis with a couple of shots to the helmet just before the switch – always good to ring your goalie’s bell just before he has to play the rest of the game for you! At the switch it was Team Juniors 7 – Team Russ 2 – again would the 5 goal lead be enough? Second half was pretty good lacrosse, tight defense and close checking – hard times for the goalies as there were a couple of more shots to the masks at each end – Team Russ was able to score 6 but it was just not enough as Team Juniors were able to get 3 past Justin and run out the clock to the cheering of the crowd (surprising number of spectators!, at least 10 that I could count, maybe we should sell tickets). Final score Team Juniors 10 – Team Russ 8. 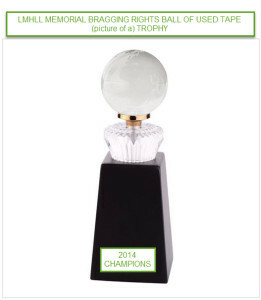 Team Juniors are the winners of the 2014 LMHLL MemorialBraggingRightsUsedBallOfTape Trophy. Once the obligatory handshakes and on floor celebrations were complete, most of the players and fans retired to the Alibi Roadhouse where the Gold and Bronze awards were presented and playoff and season long exploits were retold again and again and mocked in a suitably appropriate manner. …..and now the countdown begins …..34 weeks to go until LMHLL 2015 begins – will salary cap space restrictions break up Team Juniors, who will retire, which team will be able to bring in any rookies or unrestricted free agents? Will the long rumoured expansion take place and how may $ will a new franchise be worth? We’ll just have to wait for 2015 to find out. Not sure who, if anyone, picked the goalie rotation for this game, but it was a fortuitous choice. Justin showed up at the last minute and looked shaky in the opening minutes. Team Blair was up by 4 in the first 10 minutes and Gord was stopping everything Team Joe could throw at him. It wasn’t until the 13 minute mark before Team Joe finally found the back of the net. Both teams settled down to some real lacrosse with Gordon scoring a very late goal to make it 5-2 after 1. Austin got this one back seconds into the 2nd and Team Joe was pushing hard and closing one goal at a time – Low scored just before the goalie switch to close the score to 6-5 and a pretty Low to Austin passing play tied it up shortly after the switch. But that was to be as close as Team Joe was going to get – Vlemmix with 3 straight and Platt with a nice long ball catch and goal opened up the game to make it 10-6 for Team Blair heading into the last few minutes. Low and Austin with a couple of goals made it tense but Platt with a close in goal closed out the scoring – Team Blair up 11-8, 3 minutes to go. Somebody is going to have to explain to me this Team Blair strategy of taking last minute unforced penalties – leading by 3 in a tight game, Van Slyke takes an unsportsmanlike penalty with 3 minutes to go – this could get interesting……but, the penalty shot was denied by Gord and Team Blair ran out the clock to win the coveted EveryWinnerHasToGetSomethingChampionOfTheLosersRound Bronze Award (Girl’s Lax Bobblehead version). The gold and bronze medal games of the 2014 playoffs! TONIGHT August 27, 2014, Kinsmen Arena, doors open 6:45. Bring the fans early as seating is limited and we expect a sold out crowd. Medal/trophy presentation ceremony at the Alibi Roadhouse 10:00pm. Appetizers provided at 8:45ish and 10:00ish. See you all on the floor for the ultimate test of London Masters House League Lacrosse of the 2014 season. The arena was rocking for this game – fan support was tremendous- there were a minimum of 4 youthful fans in attendance (playing noisily in the far corner, keenly watching their favourite player on the floor, hopefully seeing his 1st period highlight reel goal! ), maybe even some adults in the luxury boxes though those may have been curious or bored players from the first game scoping out their possible opponents for next week. 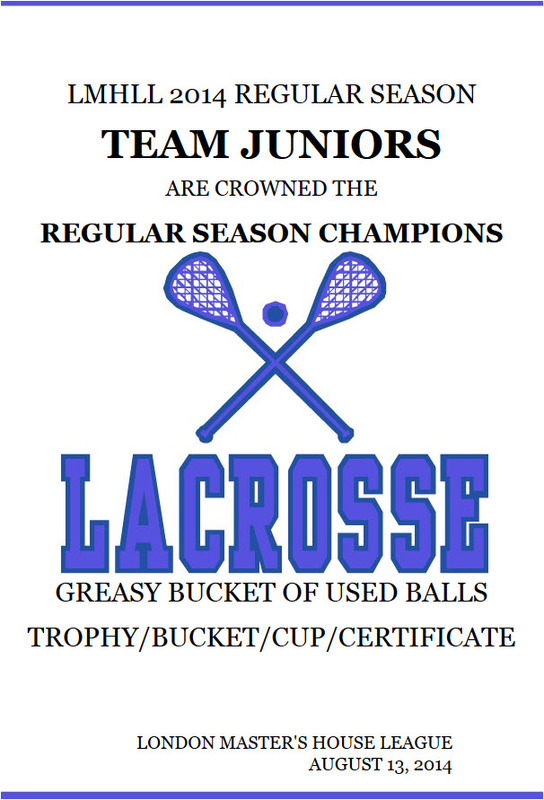 Team Juniors were heavily favoured in this game, winners of the coveted Bucket of Greasy Balls for regular season dominance and a 4-1-1 2014 season record against Team Blair – should be closest thing to a sure bet. But, as noted previously, Team Juniors made the debatable choice to shoot easy first…. The decision appeared to immediately pay off as they scored a quick goal right off the face off. A few more goals before Team Blair was able to solve Justin and the game settled in to tight checking and back and forth play. Heading in to the half, the Juniors’ lead was only 6-3 – probably not enough. Could they keep Team Blair from getting more than 3 shots on net? Would they pay a heavy price as a result of Ashmore’s decision? Second half was more of the same – back and forth with really tight defense. A couple of defensive breakdowns at both ends allowed a couple of goals but tight checking and a lock down coverage on both teams’ scorers was the order of the day. Both teams were able to add 4 goals to their total but Team Blair was unable to close the gap permanently and Team Juniors punched their ticket to the big game with a convincing victory – Team Juniors 10 – Team Blair 7. Next week, August 27, 2014……THE FINALS! For all the marbles, balls, grungy, damp towels…. what we all play for…. Being as the arena staff wants to go home as soon as possible, championship winning players will be discouraged from doffing their clothes and running around the arena to the adulation of their fan(s) (we really don’t want any arrests or fan/player hospitalizations due to mental trauma), THE TROPHY(certificate) will be presented at the Alibi Roadhouse (Oxford St) shortly after the final game. Assorted munchies will be provided starting at 8:45 or so and more at 10:00, but all first game players are urged to stick around and shower abuse and heckle the teams in the final (or just shower (PLEASE!) and go have nachos, wings and beer – whatever works). See you all next week for the 2014 finale and subsequent debriefing and discussion at the Alibi. The pregame anticipation was sky high and the fans were looking for a night of high speed, high energy lacrosse. Kinsmen Arena was in a festive mode as the regular season hardware (paperware?) was handed out (well, taped to the dressing room doors!) 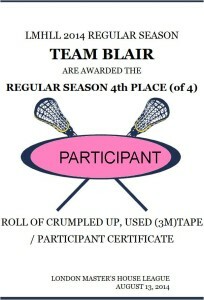 to Team Juniors and Team Blair. Rumour has it that Bill Merkley has offered a special deal to both Team Juniors and Team Blair on commemorative gold rings. The goalie question was at the top of everyone’s mind – what would be the winning strategy? which goalie do you start with? The question was so important that it would appear that the first game’s choice was more or less random according to which dressing room was closest to the arena entrance. With respect to in game strategy, apparently there was some thought given to possibly allowing a breakway or two against Justin just before the halfway change just to try to put him off his game – hard to tell if this was implemented as it wouldn’t be much different from normal for any of the 4 teams. In any case, for the 2nd game Team Junior representative made the call, shoot on the easy target first and hope that Justin was tired enough in the 2nd half to be able to maintain a lead. This appeared to be a winning formula in Game #1 but as we are often told – past performance is no guarantee of future results! That’s why we play the games! In the first game, Team Joe was heavily favoured having a 5-1-0 regular season record against their opponents but it appeared that Team Russ was prepared to prove the ProLine odds wrong. Team Russ got to Gord early while Justin stymied the Team Joe shooters. Going into the half Team Russ was ahead 7-2. Would 5 goals be enough of a lead? ..and it quickly appeared that everything would fall apart – John Low gritted his teeth, put his head down and scored 2 quick goals by sheer force of will. A dangerous shot penalty and Lowsy scores another on the penalty shot and the lead is cut to 2. Another penalty and second penalty shot, but Team Joe is denied by Gord! Team Russ was able to kill this penalty but then an unsportsmanlike call and another penalty shot! (these tactics didn’t work very well for Team Blair last week, but maybe there was a carefully considered reason to try this again)…and again Team Joe was denied! Team Joe was able to score once more to pull to within 1 but Team Russ quickly got back on track and scored their 8th to break the momentum. Then a slight misstep in defender coverage allowed the JKOW to score 2 quick goals. Team Joe kept fighting back, scoring a few more but Gord blocked a number of critical late period chances to maintain the 2 goal lead and Team Russ ran out the clock knowing they were on their way to the finals – final score Team Russ 11 – Team Joe 9. Overall a very good game, close, back and forth play – what LMHLL is all about! The second season starts tonight – regular season games are for contractual obligations, playoff are for GLORY! Remember that for playoffs and finals goalies will switch at halftime, higher placing team gets to choose which goalie they start with. With unbalanced goaltending (theoretically) out of the mix, it is ALL up to the runners – you win or lose on your own efforts! Have fun…no pressure…REALLY! PS. Let me know if I should print up one of these award certificates for you, full colour, ready for framing and mounting on your lacrosse achievement wall. WEEK #16 RESULTS, FINAL STANDINGS, ON TO THE PLAYOFFS! Walking in to the arena last night, you could feel the pressure and the anticipation – players were chomping at the bit, just waiting to put it all on the line, jockeying for that last minute playoff seeding advantage. Well, last minute anyway – 15 min to game time and there were only 2 goalies and 4 runners in the arena – no point in getting there too early! First game, Team Russ jumped out to a quick lead but Team Joe kept it close, trailing by 2 at the end of the 1st and tied at the end of 2. In the 3rd, the lead was exchanged a couple of times before Team Joe pulled ahead by 4 late in the period – a couple of quick, last minute goals by Team Russ made things a bit tense on the Team Joe bench but they were able to run out the time without further drama. Final score, Team Joe 15 – Team Russ 13. Not a good start for either of the goalie’s last minute run at Justin’s lead in the GA average. Team Joe’s win put them in to a temporary tie for 1st place and the arena was buzzing (flies?, A/C noise?, anticipation) for the upcoming final game of the regular season. Would Team Juniors be able to win and finish first decisively? Would Team Blair be able to climb out of the basement? Would MATH be required to figure out the final standings? Would the goalies be able to keep the scores in single digits? And that’s why we play the game – to answer these deep philosophical questions! Team Juniors exploded out of the gate, getting to Gord early and often. But, as is so typical in LMLHL, any lead is only the same number of shots away from a tie game. Team Blair kept picking away in the 2nd and 3rd periods, getting close and then allowing the Juniors to extend their lead again. Momentum shifted back and forth and the crowd was going wild. A couple of injuries looked like they might be devastating as Ashmore and Platt hobbled off the floor but in true Bob Baun fashion, Ashmore dragged himself back on to try to will the Juniors to victory. As time started to get short, Team Blair scored to pull within 1 …BUT… it was a bank shot from behind the net – after conferring, the referees waved the goal off and awarded a penalty shot and penalty to the Juniors. A goal on the penalty shot made it 13-10, but more controversy as the scorekeeper hadn’t un-recorded the illegal Team Blair goal – tempers were starting to fray! Another Team Blair goal, this time valid brought the score to 13-11 BUT in an interesting tactical move Team Blair took an Unsportsmanlike penalty on the way to the ensuing faceoff. Another penalty shot and 2 minutes shorthanded for the rest of the game! – (do they play better shorthanded, do they like the challenge of playing from behind, is this a new cutting edge LMLA coaching strategy….? Way above my coaching pay grade to have to try to comprehend). In any case, it almost worked – Gord denied the penalty shot and a shorthanded goal closed the gap to 1 with less than a minute to go. But, the deep strategy and high level planning was all for naught, Team Juniors scored one last time, with seconds to go, to put a stake through Team Blair’s comeback hopes – final result Team Juniors 14 – Team Blair 12. An exciting end to the season and a good omen for the upcoming playoffs. Two high scoring games that do nothing (good) for goalie GAA. I hope all of you appreciate the deep concern that the goalies have for your tender psyches – sacrificing our GAA, possibly damaging our chances at multi-year, mega$ contract re-negotiations by allowing so many goals to be scored to bolster the fragile self esteem(s) of the runners. Think of the wailing and crying if this week’s results had been 0-0 and 1-0, all the runners would quit in disgust at their inability to score. With the victory, Team Juniors finish first overall and win the Bucket of Greasy Used Balls Trophy/Bucket/Cup. 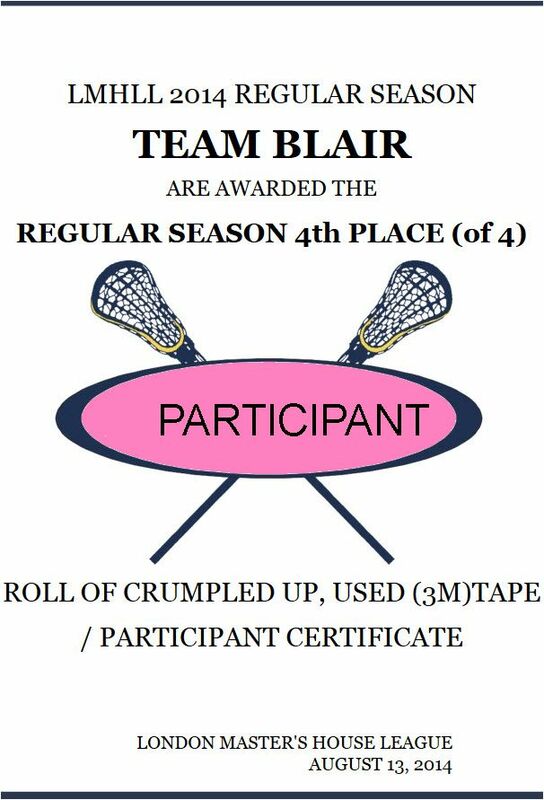 Team Blair after a strong start to the season, fade over the long term and finish last, but still get the Roll of Crumpled Up (3M) Tape Award (Participant ribbon version) and the coveted first round draft pick of incoming new registrations next year. FYI, for the playoffs, to leave it all up to each team’s scoring prowess (what COULD go worng? ), we will be switching goalies at half time – team with the higher season standing chooses which goalie they get first. More thinking required so it could be interesting to see if we get more of the new cutting edge LAXthink showing up. In the first game, it looked like both teams were revving up for the upcoming playoffs. Good turnout, quick passes, fast breaks, tight checking, lots of effort and running – pleasant game to watch. Team Russ scored a couple early but Team Juniors fought back to tie it midway through the 1st period. Team Russ was able to get another one late and the 1st period ended with Team Russ ahead 3-2. 2nd period was back and forth again with Team Juniors turning it on late in the period and taking advantage of a last minute goalie brain fart to end the period up by one – 7-6. Juniors pressed hard early in the 3rd and were up 10-8 but were unable to hold off the dreaded, vociferous JKOW. End result Team Juniors 10 – Team Russ 10. Second game wasn’t as high intensity. Benches were shorter with Team Blair missing both their high scoring ringers, but Justin, nursing a sore knee in the Team Joe net, seemed to provide Team Blair a chance at an interesting battle. And so it appeared to start – 1st period was a close, low scoring affair – ending deadlocked at 2. Second and third periods were all Team Joe with Matt Austin leading the way and Justin flat out robbing Matt Vlemmix on numerous opportunities. So much for the sore knee when chirping rights are on the line! Final result Team Joe 10 – Team Blair 3. Last week of the regular season should be interesting – Team Russ vs Team Joe may vault one of the teams into a temporary tie for first depending on the results of the late game. 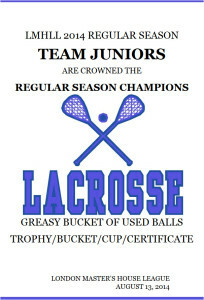 Team Juniors can clinch the coveted regular season champion’s “Bucket of Greasy Used Balls Trophy/Cup/Bucket(? )” with a win or a tie. Team Blair with a victory might deny Team Juniors their quest for 1st and possibly avoid the “Roll of Crumpled Up Tape Award” by climbing out of last place . Come out, one and all, to see London Masters House League lacrosse put it all on the line to jockey for the all important playoff seedings. For lack of anything better and to make stuff challenging for the MATH IS HARD crowd, ties to be broken using the infamous OLA formula (Head to Head record, then GF/(GF+GA) using scores between all teams, then lowest penalty minutes, then coin toss). I’ll leave it to the OCD types to run through the various permutation and combinations but suffice to say, only 1 possible result of 9 doesn’t end up with a Team Juniors vs Team Blair/ Team Joe vs. Team Russ first round matchup. Extra credit if you show your work in a neat and readable format! Tonight’s games August 6, 2014 – at the new, earlier times!